Boy do I love fancy playing cards. Not only do they make playing cards more fun. They also make you want to play cards more often—which is generally healthy, so long as you don't struggle with a gambling edition. My favorite card game is spades, and boy would that be fun with a trippy deck of GLITCH cards. GLITCH is the brand and the description. The design looks like it was churned out by buggy graphic design software or a glitchy CMYK printer. 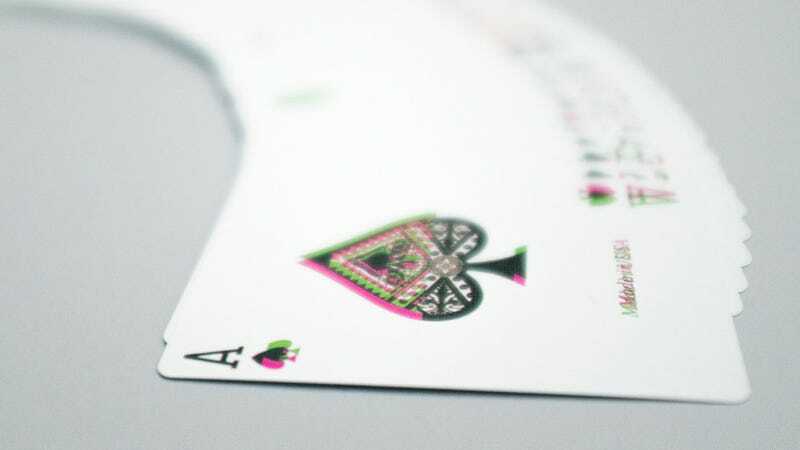 Each card's eccentricities are different than the next, and the whole deck is made in the USA. At $15 a pop, they're more expensive than what you might buy at Walmart, you'll turn some heads.